This plug-in queries a Microsoft SQL Server for host records and optionally reverse records. For forward lookups (name to IP) you need to include a @hostname parameter in the SELECT statement, and the query must return two columns; IP-address and TTL as the first and second columns. 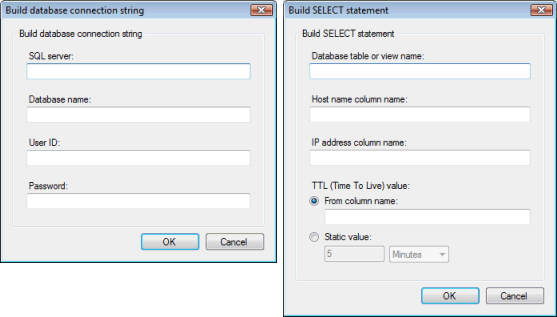 For reverse lookups (IP to name) you need to include a @ipaddress parameter in the SELECT statement, and the query must return two columns; host-name and TTL as the first and second columns. For either type of lookups (forward/reverse), you may optionally include a @clientip parameter which will contain the IP address of the client requesting the data. NOTE: Serving data from directly from a SQL server with this plug-in can be very powerful, but keep in mind that querying a SQL server will never be as fast as serving DNS records directly from RAM, as Simple DNS Plus does when serving data from local zones. 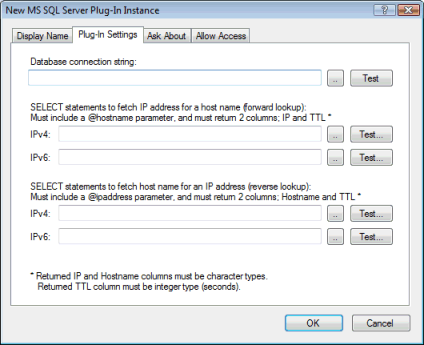 Therefore we recommend that you limit plug-in queries to only those specific domains that you have stored in SQL.